The town of Atikokan, home to approximately 2800 people, is very fortunate to have such an amazing sense of community. Without community members that volunteer their time, places such as the Pictograph Gallery would cease to exist. Opened on March 11, 1988, the Pictograph Gallery was established by an idea held by four artists to fill a need which has now evolved into a highly respected and much-welcomed facility through which local and regional artists and artisans can have their work featured. The Pictograph Gallery was founded by four individuals, Sally Burns, Elsa Kosola, Peggy Michels, and Lise Sorensen, who saw the need and desire to have a familiar place for themselves and others to be able to proudly display their hard work. As the gallery continued to move forward, the founders applied to become a Recommender Gallery for Exhibition Assistance Grants from the Ontario Arts Council. Upon successfully receiving this status, the gallery is able to supply grant money to applicants for help with exhibition costs. This status has helped The Pictograph Gallery in many ways, including the attraction of bringing new exhibitors. 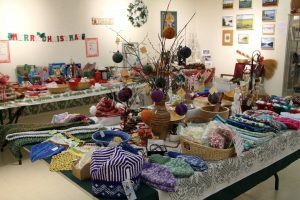 Christmas Sale featuring local artists/crafters. As a part of their routine, the volunteers keep track of how many visitors are coming to view each exhibit. The Pictograph gallery had approximately 1850 visitors in 2017, and about 2235 visitors in 2018. Over the years, The Pictograph Gallery has grown in popularity, with the upcoming 2019 and 2020 season fully booked with artist and more bookings coming in already for 2021! There are a total of six exhibits each year that last for a duration of six weeks each, as well as an annual Christmas Market that typically runs from November to the middle of December. At the beginning of each exhibit, there is a grand opening where the Artist occasionally will be present to show off their talent! 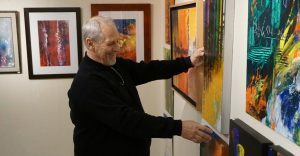 The exhibits are typically artist that feature paintings, quilts, photography, and pottery, however, the gallery is open to having any type of artist/artisan come and display an exhibit! 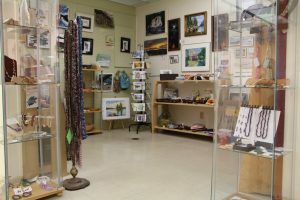 The Pictograph Gallery also has a gift shop that features many of their past artist, as well as other local and regional artist pieces. The Pictograph Gallery has received grants for a Summer Student, which the volunteers have been very thankful for. The summer student is with the gallery for a total of 8 weeks and brings youthful enthusiasm. Summer is the busiest season for the gallery, as the season brings the most tourist into town! This is the most sought after exhibit time for the gallery as many artists want their exhibit displayed during the summer months. To support the continuation of The Pictograph Gallery, the volunteers have a book fundraiser that allows individuals to come to the gallery and buy books, magazines and movies at an affordable price. They also receive a small commission from any of the displays that are sold. There is also a donation jar located at the front desk, admission is free, but donations are greatly appreciated. The Pictograph Gallery also has a membership option, where individuals can opt to pay $10.00 for 1 year, $15.00 for 2 years, or $100.00 for a lifetime. Membership funds, as well as sales commissions, donations, fundraising, etc. are used to pay for utilities and operating expenses. The Pictograph Gallery would also like to acknowledge the support of Atikokan Ontario Power Generation for their continuous support! Without the help of others and the time of The Pictograph Gallery volunteers, Atikokan would lose a great entity. Atikokan is very fortunate to have such a well-established gallery, especially being a small Northwest Ontario community. 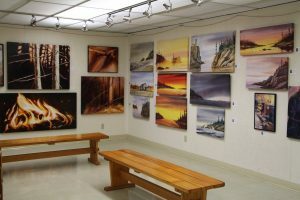 The Pictograph Gallery is located in the lower level of the Voyageur Mall, Main Street, Atikokan. It is open, during the year, from 12:00PM-3:00 PM Tuesday through Saturday, depending on volunteer availability. During the summer, it is open 11:00 AM to 4:00 PM Monday through Saturday. If you have not gone and spent some time at the Pictograph Gallery, please take the time and support this wonderful non-for profit entity. The volunteers are very friendly and knowledgeable and would love to show and explain the featuring exhibit to you. Atikokan is on the doorstep of one of Ontario’s most traditional wilderness areas, as Quetico Provincial Park stands among the best for its beauty and its ruggedness. We’re only too happy to have you here, whether it’s for a day, for a week, or a lifetime. We are the Canoeing Capital of Canada. We are the Gateway to Quetico Provincial Park. We are Naturally Wild.